German Chamomile is now back in stock. German Chamomile in full flower. German Chamomile (Matricaria chamomilla) is an annual type of chamomile, popular with herbalists and for cosmetic uses since it is the variety of chamomile with the highest oil content. Chamomile grows best in cool conditions and should be planted in part shade, but will also grow full sun. The soil should be dry. 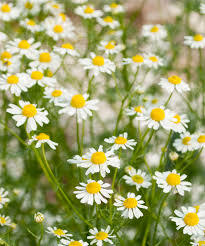 Chamomile is drought tolerant and only needs to be watered in times of prolonged drought. Like most herbs, chamomile grows best when it is not fussed over. Too much fertilizer will result in lots of weakly flavored foliage and few flowers.